We have dry, clean firewood - Guaranteed ! Our KILN DRIED firewood will save you time, $$$ and aggravation. 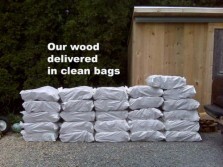 Our firewood is delivered in large bags that are easy to store. NO ONE ELSE DOES FIREWOOD THE WAY WE DO !! Others sell cheap firewood by cutting corners on quantity & quality. We never cut corners........YOU GET WHAT YOU PAY FOR ! because we know our firewood is dry. Buyer beware. They don't give receipts or guarantees. Definition of "Seasoned" KILN DRIED Firewood is produced using high tech processes regulated by state agencies. There is no legal definition for "seasoned" firewood. Anyone can call any firewood "seasoned". cubic foot volumes as defined by NYS Bureau of Weights & Measurements They sell deceptive "Face Cords" that are not legal volumes in NYS. Use less firewood & have hotter fires. High moisture content = less heat & more $$$ spent. More wood to buy & store. Delivered in bags ? All of our KILN DRIED Firewood is delivered in bags. The bags are precisely measured & easy to store. They dump your wood in a pile. You can't measure it & have to work hard to move it. Consistent Quality ? KILN DRIED Firewood is the same premium quality every time, even during the coldest months. "Seasoned" firewood is unpredictable & mid-Winter supplies are lowest in quality. Price ? Our pricing is the lowest on Long Island for bagged KILN DRIED Firewood. Unadvertised pricing for quantities inconsistently measured. Where is it stored ? We store KILN DRIED Firewood indoors keeping it toasty warm & dry. They store firewood in large piles that are subjected to rain, snow & other elements. Does it have bugs ? Our KILN DRIED Firewood is USDA Certified to be free of bugs & larvae. Insects & pests live in outdoor wood piles. Bugs travel well with firewood. Clean ? Kept free of dirt & delivered clean to you. You can store it inside. Stored on dirt & dumped in your yard. The dirt ends up in your house. you will burn every log. They send you the bad cuts that cannot be burned. Length ? Industry standard 15 to 16" lengths. Nothing longer or shorter. Inconsistent random lengths. Some pieces may not fit your burning area. Types of Wood ? Our Hardwoods Mix is processed from specific hardwood species (as listed on the product page). Early in the Spring we also have some specialty woods (Ash, Cherry & Hickory) Random wood is cut & mixed together with no species guaranteed. There are often softwood species mixed in & they never have any specialty woods. & see if they get back to you. & hope they get it right. Order Tracking ? Track your order online on the Order Tracking Page. Look up your past orders there too. They don't track orders. You're left guessing. No past orders to look up because few repeat customers. with Visa, Master Card or Discover. Cryptocurrency payments available too. Cash payment preferred. Give them your personal credit card info over phone & hope it doesn't get stolen. because they have poor quality firewood & service.